The AutoCrib® RDS (Remote Dispensing Station) industrial vending machine is the most advanced helix-coil machine on the market. This industrial vending system is purpose-built for high-demand industrial environments with up to 16.7% more product capacity than other machines on the market. The inventory management capabilities and software reporting are superior to any other advanced helix-coil machine available. Designed to increase accountability, improve productivity, and reduce consumption, they system replaces spreadsheets and ERP systems that don’t accurately reflect what you have in inventory. Industrial vending machines document inventory transactions automatically, provide secure inventory control at the point-of-use, and streamline purchasing with automated reordering. AutoCrib® manufactures industrial vending solutions for dispensing industrial supplies. Industrial vending machines are ideally suited for inventory management programs that require employee accountability of consumable inventory and returnable durable items. Control product distribution by employee, department, and job. You can also manage employees and departments by spending. Get advanced reporting on usage and spending including by department, job, machine, and employee. Schedule the automated delivery of reports by email. Quickly see your on-hand inventory levels and manage your inventory with the most accurate real-time information. Industrial vending machines provide point-of-use access to supplies, allowing employees to spend more time on the job and less time at the storeroom. You can select who has access to which items in what quantities and at what times. Products are secured 24/7 to control usage and prevent theft. AutoCrib® has developed a patented guaranteed delivery system that prevents items from becoming stuck in the device. VendVerify is a laser-based system that ensures that the selected products have been dispensed before decrementing inventory. If a product is not delivered, the machine will “jog” the motor incrementally until a successful vend so that inventory accuracy is assured and only one item is dispensed per issue. 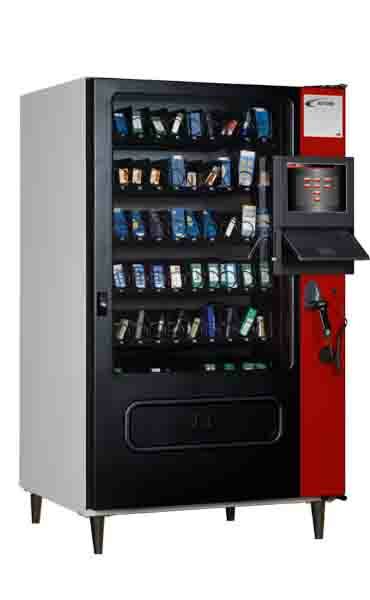 Employees can issue items from the industrial vending machine with quick scan capability. A built-in barcode scanner makes issuing items “point-and-click” simple. The machine can be set up to automatically batch process purchase orders. This means you can prevent stock-outs and reduce your administrative processing costs. The RDS TouchVend has an optional user-friendly touchscreen and a physical keyboard that expands the machine’s features and capabilities. This easy to use interface lets users search for products and get detailed information about items. Using the RDS TouchVend you can also add on an auxiliary machine to double the capacity of your system. You can dispense multiple items in the same transaction. Regrinds can save up to 80% of your costs vs. new cutting tools, but they are often underused because operators use new tools without realizing there was a comparable regrind in stock. The force regrinds feature issues regrinds before new cutting tools, significantly reducing your inventory spend. AutoCrib® software is an enterprise-level solution with powerful functionality out-of-the-box that helps you manage your inventory. AutoCrib® offers both cloud-based and on-premise inventory management solutions. Select from a wide range of helix-coil sizes and configure multiple motors for large items. The shelf spacing is adjustable to allow for various heights. AutoCrib® RDS is a truly scalable, enterprise-ready inventory management solution. You can expand your industrial vending program with multiple machines and upgrade to advanced industrial vending machines from AutoCrib®. All of our machines have a familiar interface and integrate with our standardized inventory software.